We’re back! I don’t know for how long, but I hope to post a bit more frequently than, you know, not at all. Long story made very short, I’ve been working long hours to keep the flock supplied with toys, and focussing on them when I’m home, rather than posting. Ptak loathes any device that takes my attention away from him, being a proper parrot. Mavi is admittedly not too keen, either, though he does enjoy posing for blog pictures. But life is good, in spite of the odd broken bone (mine), and a general lack of free time. Although I keep up with a number of my favourite blogs, what inspired me to get back to Students with Birds was one little ping from my mobile. Upon checking it, I discovered several notifications and an influx of views from WordPress! As it turns out, this little parrot blog has gone a bit viral, at least as highly specialised, serious, and somewhat controversial sites go. My daily visitors number in the thousands – which isn’t much, unless you write about topics that most people don’t know or care about. With the surge in popularity, I also happen to have haters! These are mercifully few and far between. I truly appreciate different opinions (this is, after all, what makes us human, and I do love a good debate), but less so the apparent attitude of ‘I can’t articulate WHY I disagree, so I’ll throw as many insults as I can think up.’ Still, it doesn’t get me down, because it means I’ve made someone think, in the end. So here is a sincere thank-you to everyone who has liked, commented, shared, followed, or even just stopped by to read. I will try to catch up with everyone’s comments and questions this week! In the meantime, the flock – aka Mavi and Ptak – would like to issue a very grand gesture of their own (ahem). They wish me to convey how much they enjoy having minions fans, and would like to give their thanks to everyone who’s stopped by. In case you’d like to catch up, the article that has garnered so much attention is one of my favourites: Seven Reasons Why Parrots are Not Good Pets. I mean, if any one were to be passed around by folks, I’m grateful it’s this one. Controversial, yes. But also one I wish everyone could read. 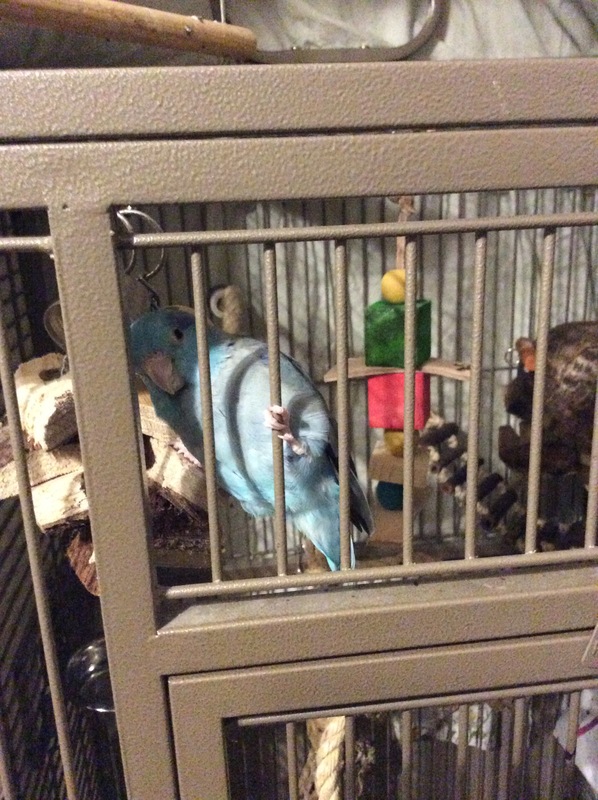 And lest you think I am a cold-hearted parrot-hater, here is a follow-up article in the series: Why I Love Parrots as Companion Animals, because truth is, I adore these little buggers. They may drive me nuts sometimes, but they are also dear to me beyond any words. If there is a topic you’d like to see here, feel free to get in touch. Comments and questions are also always welcome, even if you just want to state your side of things! Just remember to respect others (plus, bonus, you’re more likely to make your point and convince people that way). Welcome back! I saw a link to the “Seven Reasons…” post and was wondering what happened to you. Life does tend to get in the way sometimes! Glad to see that the flock is doing well. I have been volunteering at a rescue and adoption shelter for pet birds, and I agree now more than ever that parrots are not good pets. So many birds given up for so many reasons, many of them that could be prevented with proper education. But they are wonderful companions for people who know what to expect. I added an older Senegal to my flock this year, and while he loves me, he doesn’t seem too fond of anyone else, although he does tolerate them. Thank you *so* much for this blog and links. I’m about to acquire (be acquired by?) a parrot from a friend. I was feeding her animals while she was away, and fell in love with her remarkable parrot – I think he’s a Senegal. Alas, he lives in the corner of small room cos the family no longer have time for him as they’ve grown up, and are fed up with his squawking. Bloody hell, he can make a noise! The family have agreed to give him to me cos they agree I can give him more attention. In the 5 days we bonded over the kale and strawberries I’d picked for him from my garden and hung up in more and more elaborate ‘kebabs’ as the days progressed and he figured out how to get to them. He *loves* kale stems, and it’s thanks to your blog that I learned that I could feed them to him. The style and honesty of your site is perfect. I’m also about to splash out on what is bound to be the first of many purchases, and get a UV lamp as you suggest. He currently gets no sunshine, and I hope this will help him in his transition to his new home. Thanks again, and please keep posting. Newbies like me (and my soon-to-be ‘housemate’) need you! ps Are fresh coconut pieces ok? I gave him a few and he purred! Too high fat? Turns out he’s a caique. Which I now know how to pronounce, at least. So I guess that means I’m spending the next couple of weeks making toys…. Caiques are awesome! They are hilarious little clowns. Hope you’re enjoying your new bud! Sweets – love doesn’t begin to describe it. 6months together now, and all is great. The boyo adores me almost as much as I him. With all the research I’ve been doing, think I could run a degree programme! 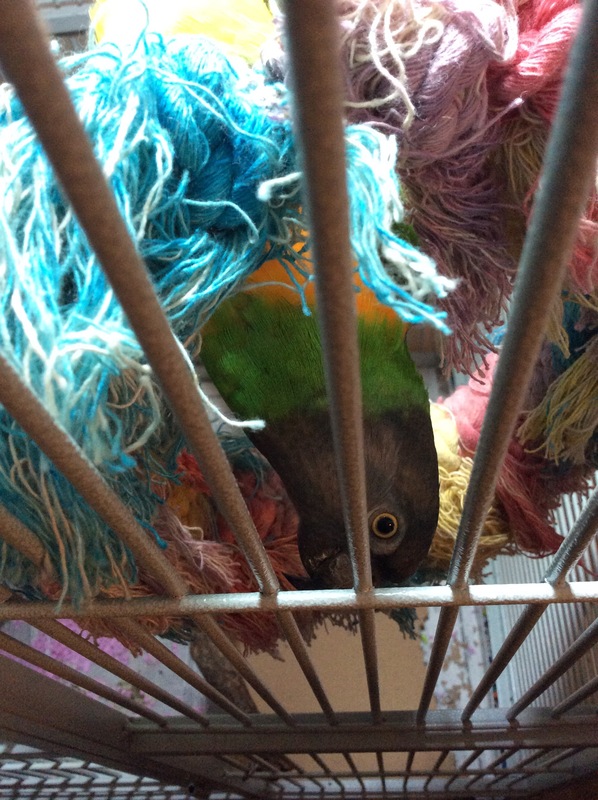 I’ve completely overhauled his diet, got him a lovely light, he gets lots of cuddles & out-of-cage playtime. He even lets me help with pin-feathers now, and doesn’t try to rip my eyes out every time I go near him. How lovely that he’s learned to relax, and re-learned how to play. Obsessed nutritionist is good! 😀 Just about everything is good in moderation. Mine get some coconut occasionally, sometimes even in the shell. It can make a great toy!